Did you plan ahead tonight? Or was it take-out Chinese? I stopped by the market on the way home from work and grabbed a house-smoked salmon fillet. Ate it with leftover red quinoa cooked in chicken broth for more flavor (can use veggie broth) and garlic kale. Delicious, and less than five minutes to prep and plate. Planning ahead is such an asset and a topic I find myself discussing with every client in every session. Cook up a batch of brown rice, quinoa, buckwheat groats, amaranth, millet, any non-gluten grain, on Sunday night, along with a bunch of kale or chard or spinach, and there’s the base for your next 3 meals. Eat the quinoa for breakfast; use the greens under chicken breast or lentils for lunch. I’ve had a bit of a renaissance with quinoa lately. We’re falling in love again. Quinoa is a relative of leafy green vegetables like spinach and Swiss chard, and it is not a grain but actually a seed, offering all nine essential amino acids. It’s quite a good protein source and has thus become the darling of vegetarian diets. Quinoa is high in magnesium, a mineral in which many of us are deficient. Magnesium is cardio-protective, relaxes blood vessels, and fosters restful sleep. 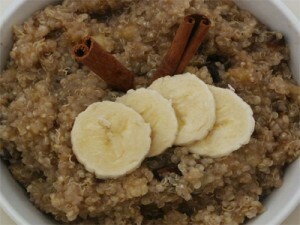 Quinoa makes a great breakfast too–make it sweet instead of savory. Here’s a recipe. Somehow we’ve gone from dinner back to breakfast…..